Being a working woman in India is often not easy: there always seems to be ‘too much to do’. Here are the 7 productivity lessons from ants that every woman should know. 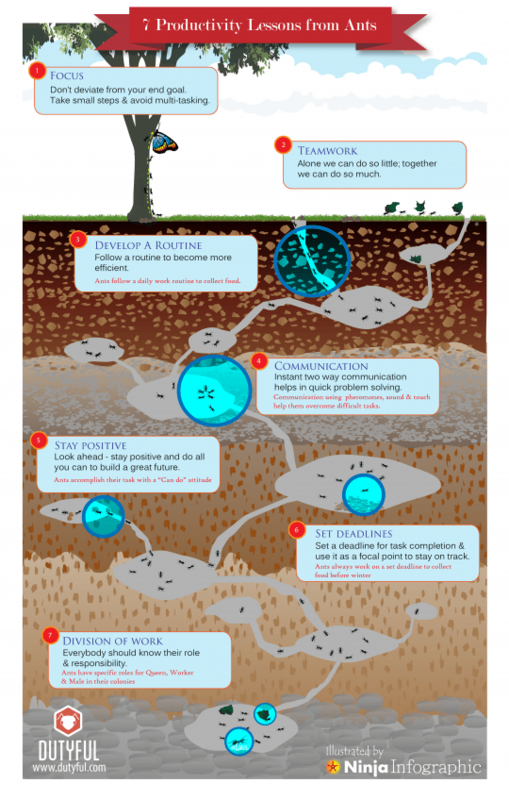 A few days back I came across an infographic titled 7 Productivity Lessons from Ants. Packed with wisdom and insights, I loved reading it. Refer below to the details. As a working mother, I’m always looking for ways and means to improve and enhance my productivity. After all, we are trying to do things as quickly and efficiently as we can every single day. And honestly, whenever I see or read or think about ants, I almost always go back with a lesson. They are small, hard-working, focused and do what they have to do! Look around you at anyone who achieved anything in life – and you will see one defining characteristic. That is FOCUS. Focus is important for anyone in life, but more critical if you are a working woman. a. Be focused on what you need to accomplish at work for a day, week, month, quarter, year. Keep your eyes on the end goal and objective. In between, even if you deviate, that’s OK! But make sure you come back on track as soon as you can. The best way to do this is to write down what you need to accomplish for a specific time horizon, and look at it at the start of every single day. That will ensure you are on track, at least as you start each day! b. Be crystal clear on what all you need to do as a part of your personal life (in terms of things to do at home) and for yourself. Identify what is absolutely essential, and let go of everything else. Either outsource or delegate or just let it be. In the long run, many trivial things that you are stuck up about (in terms of your thoughts, time and energies) are really not worth it. For example, I used to be a stickler for a clean, well-organized house every single day, and anything below my expectations was not acceptable. Over time, I realized that this was taking up a lot of my time and energy, taking me away from what I really wanted to do and it really did not matter to others .With time, I relaxed my own benchmarks and go easy on myself. And when I do embark on a house cleaning exercise, it is usually time-boxed. c. Give undivided time and attention to the task at hand and make sure you complete it. Say NO if and when you have to say NO – To people, friends, distractions, phone calls, TV, Social Media, the spouse, the boss, mummy, spouse, kids et al. The sooner you learn to say NO, the better for you. Most importantly, as they ants do – focus on one small thing at a time. Multi-tasking is a working woman’s boon, but for things which need to be done really well – Do it one at a time. Your maid/helper/cook – will always be on the No. 1 spot. Trust me, you really cannot be a working woman and have this wrong! Most importantly, as the ants do – recognize that you will go farther if you collaborate as a team. I can’t emphasize this enough. Suffice to say, create a routine that works for you. Stick with it. And see the magic unfold. It seems very simple and logical. But for many working women, it takes years of experience, many, many failures and serious introspection to come up with the right routine. And once you do, everything falls in line. As a working woman, you should have the following routines planned out – a daily routine, a weekly routine and a monthly routine. Among other things make sure your daily routine has time for eating right and healthy, catching up on the news and general reading. Make sure your weekly routine has time for exercise, doing something you love (‘ME’ time) and speaking to one/two people in your friends and family network. Networking is critical in the long run, and many working woman lose out here. Ensure your monthly routine has some time to learn something new. Constantly learning, re-skilling, cross-skilling and up-skilling is the need of the day. This can/should include professional learning. Most importantly, as the ants do – follow a routine to become more efficient and effective. Make sure you communicate things that need to be said in a clear and concise fashion – at least to those who play a critical role in your life. Be sure to express clearly what you really want and expect from them – especially your core team at home. Be real and reasonable on expectations from others. And most importantly, say it, and listen to what they have to say. As a working woman, I’ve burnt my fingers many times by assuming they know. They DON’T! Be it your maid/domestic helper, your spouse, your kids, your boss, your team – assume they don’t know till you clearly call things out for them – in terms of what you will do, and what they will do. And what is non-negotiable! Many times I assume they are OK; many times, they are not OK. So make sure you listen and pay attention to what they have to say. It makes all the difference. Lastly, to communicate clearly you need to be clear in your head. That clarity usually takes time to get, but it is well worth your time. Be clear in your mind. Be clear in your words. Most importantly, as the ants do – focus on communicating right and to the right people. And yes! Listen. Communication is two-way. Being a working woman is not easy. Being a working mother is tough. I speak from experience here. As working professionals, many women face gender discrimination, workplace bullying, harassment, slow-paced career progression, questionable compensation, unsupportive workplace environment and outdated policies. They are the realities of the environment and ecosystem one is a part of. And there is no easy way to survive, and no magic mantra to thrive. And yet, every single working woman I’ve met or known has to be positive if she is to have a fair shot in her career. So stay positive and be positive. Read positive messages/books/blogs, speak to positive people and think positive. Most importantly, as the ants do – Look ahead into a great future. The beauty of a deadline is that there is a line drawn, and the bane is that the line dies somewhere before we get there! So the universal truth is that most deadlines are really not deadlines – they end up just as moving line! As a working professional, it becomes critical to define what a deadline means to you and then set some deadlines – for your own well-being. For e.g., at work, it is important to set deadlines around how long you will stay at work on most days (critical for your personal safety), how soon you will complete tasks assigned to you, how fast will you be able to demonstrate your value, etc. Similarly, at home it becomes critical to put deadlines around phone conversations and general chit-chat/gossip, TV time, bed time, social media/facebook time, etc. Each of these deadlines if consciously defined, and judiciously worked towards will ensure success in the long run. Most importantly, as the ants do – bring on board your advocates, your allies and your brownies before the storms. Does this need explanation? Especially for things at home – identify what all needs to be done to keep your house going: cleaning, shopping, home maintenance, cooking, paying bills, etc etc. And then, divide the work or delegate the work – to family, friends or anyone else who can help you. The sooner you figure out the art and craft of division and delegation, the more productive and successful you will be at the workplace and in life! Most importantly, as they ants do – clearly define the roles and responsibilities. Share it. The sooner people know what they have to do, chances are they will do it sooner than later. These are some of the points that worked for me. What has worked for you? Leave a comment to let me know. Firstly, thank you for reading me. As many of you know, I am a regular contributor here on Women’s Web. Click here to read all my previous posts. I usually write about women at the workplace, women in IT, work life balance and the life of a working mother. However, I’d love to hear from you on what you’d like me to write about in the future. Do leave a comment below, and I’ll be sure to respond. Thanks again.